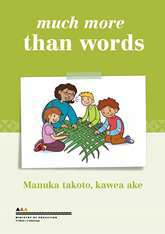 The content in this section has been produced in collaboration with the Ministry of Education and adapted from 'Much more than words | Manuka takoto, kawea ake'. If you would like to look at anything in more detail, a listing of references might be a good starting point. Flipsen, P., Jr (2006). Measuring the speech intelligibility of conversational speech in children. Clinical Linguistics and Phonetics, (20) 4, 303-312. Linguisystems, Inc. (2008). Guide to Communication Milestones. East Moline, Illinois, USA. Lowry, L. (2014). Intervening with Dual Language Learners. The Hanen Centre, Toronto, Canada. McLeod, S. & Bleile, K. (2003). Neurological and developmental foundations of speech acquisition. American Speech-Language Hearing Association Convention. Ministry of Education (2000). Much More Than Words. Reprinted in 2008. Wellington: Learning Media. Ministry of Education (1996). Te Whāriki. Wellington: Learning Media. Shriberg, L.D. (1993). Four new speech and prosody-voice measures for genetics research and other studies in developmental phonological disorders. Journal of Speech and Hearing Research, (36), 105-140. Shriberg, L.D., Kwiatkowski, J. & Gruber, F.A. (1992). Short-term and long-term normalization in developmental phonological disorders. Paper presented at the Annual Convention of the American Speech-Hearing Association, San Antonio, Tx. St. Gabriel’s Curriculum (2005). St Gabriel's Auditory-Verbal Early Intervention Centre – A Curriculum, Jan Tuohy, Jackie Brown, Charmaine Mercer-Moseley, Leonie Walsh, © Trustees of the Christian Brothers t/as St. Gabriel's School for Hearing Impaired Children, NSW Australia, 2005. This booklet is for supporting the communication development of young children. Family/whānau, early childhood educators, kaiako, health professionals and others may find it useful. It includes information about typical communication development in young children and ideas for supporting them. The booklet was published by the Ministry of Education in 2014. This page last reviewed 19 February 2018. Concerned about your child's communication or speech development?